Time and time again we are blown away by our bakers’ creativity. This cake is no exception. We bloody love the fact that Kelly didn’t give up on her mission to create an ingenious “smash cake” even though the heat was against her and she could have easily *just* presented us with a sandwich cake. A home-made chocolate-orange marble cake; chocolate icing; vegetarian sweets; milk chocolate; chocolate buttons; hundreds & thousands; a toy mallet; and a chocolate mould (see details below). I saw piñata cakes on the internet and thought they looked like something a child would enjoy. You get a delicious birthday cake but you also get to smash it up. What’s not to love? I predict that these cakes will become a bit of a craze. The biggest mistake I made was attempting to make a giant chocolate dome to cover the entire cake – and attempting to make it on the hottest day of the year. Using a balloon as a mould, I tried to make a big dome but it just wouldn’t cool down enough for the chocolate to harden. Putting it in the fridge didn’t help because as soon as I took it out again it started to collapse. I compromised by using large silicone muffin pans as moulds. I covered them in thick layers of melted milk chocolate and froze them solid. It worked! After unmoulding the chocolate I laid the domes over little mounds of sweets and then decorated both the cake and the chocolate domes. 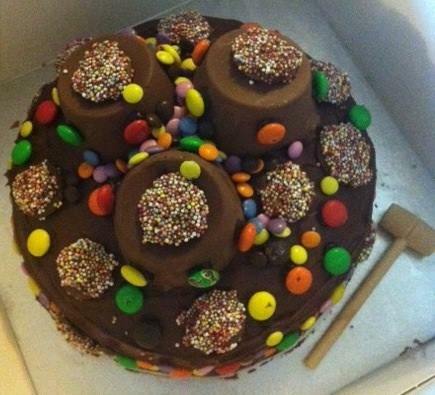 The birthday child then gets to smash the chocolate domes with the little mallet to discover the sweets inside. In the winter I will try a whole-cake dome again. Fingers crossed I’ll have a bit more success! This is my twelfth cake for Free Cakes for Kids Hackney. I do lots of volunteering in Hackney but this is special. 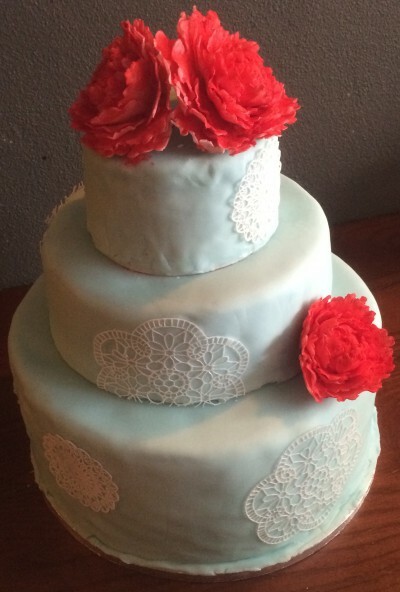 I get an opportunity to make cakes and try out new techniques and ideas – and the cake goes to someone who really needs it. If it weren’t for FCFK Hackney I wouldn’t have got to try my hand at princess cakes, football cakes, Spiderman cakes – and of course this piñata cake. If I could make a cake every week I would! I feel lots of excitement when the cake turns out alright and it’s ready to be delivered. I like that I get to remain anonymous – like some sort of birthday fairy!